Distribution and habitat: Davallia fejeensis are epiphytic ferns, with fronds arising from long aerial rhizomes which grow on and over thick bark on trees or on rock crevices. It is a fern native to Fiji, growing on moss-covered rocks and on trees in the subtropical forests. Description: Davallia fejeensis is distinguished by their furry rhizomes, which creep over the surface of the potting mixture and root down into it at regular intervals. The fur is composed of long, light brown hairs on 1-2cm (0.4-0.8 inch) thick rhizomes and is the reason why these plants have such common names as Hare’s Foot Fern. Arising from the rhizomes are 22cm (9 inch) long, grey-green stalks carrying fronds that are roughly triangular, usually around 60cm (24 inch) long and 45cm (18 inch) wide and divided into three or four leflets. Houseplant care: Davallia fejeensis are easy to care ferns. They are also remarkably tolerant of the dry air and will thrive in rooms where many other ferns would normally suffer from lack of humidity. Remove dried fronds for a good looking and healthy fern. Light: Davallia fejeensis will do best if they are grown in medium light. It will glow in good indirect light, on a north or est-facing windowsill. Temperature: Davallia fejeensis grow well in normally warm room temperatures, but they can tolerate cooler conditions. Fronds may die off if the temperature falls above 13°C (55°F), but new ones will start to grow as soon as warmer conditions prevail. 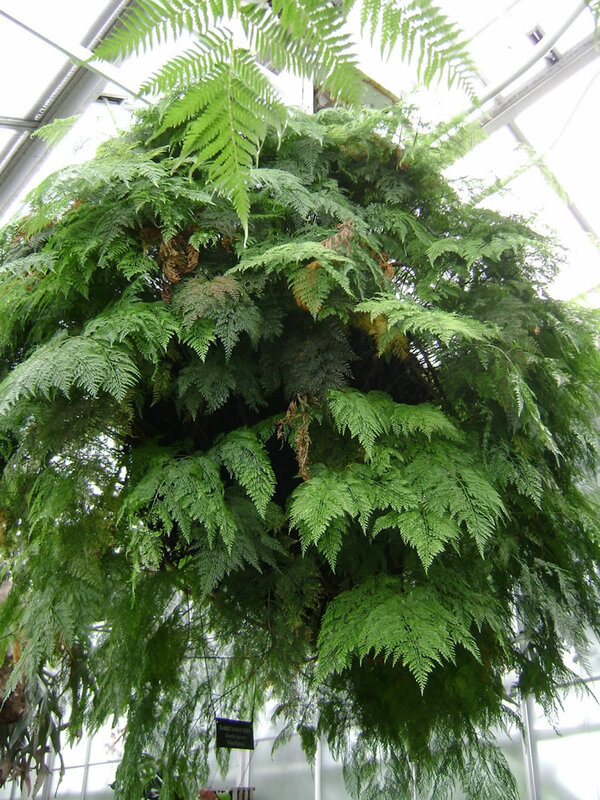 Although these ferns are tolerant houseplants, it is best to maintain a humid atmosphere by spray-misting around the plant when condition are to dry and hot. Water: Water moderately, enough to make the mixture moist throughout, but allow the top centimetre (0.4 inch) or so of the mixture to dry out before watering again. If the temperature is dropping bellow 13°C (55°F) for more than a day or two, give just enough water to keep the potting mixture from drying out completely until the temperature has risen again. Feeding: Apply a liquid fertiliser about once every two weeks to actively growing mature plants. Potting and repotting: Use either a peat-based or a half soil-based and half leaf mould potting mixture. In spring move small Davallia fejeensis into pots that are at least one size larger. Take older ferns out of their pots, trim away some of the outer roots and detach some rhizomes before replanting them in the same pots using fresh potting mixture. Propagation: To propagate these ferns, use 5-8cm (2-3 inch) long tip section of rhizomes, each with at least one to two fronds attached. In spring cut such section from the parent with a sharp knife and pin each section down with a loop wire or hairpin so that it just sits on the surface of the rooting mixture in 8cm (3 inch) half-pot. Use a mixture of equal parts of peat moss and coarse sand or a substance such as perlite and just moisten it slightly. Enclose the whole pot in a plastic bag or propagating case and keep it in bright filtered light at normal room temperature; no additional watering is required. 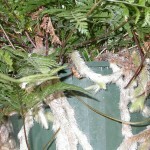 When new fronds begin to appear – usually after three or four weeks – rooting will have taken place. Gradually reduce the humidity by uncovering the young fern for increasingly longer periods over the next two or three weeks and give it enough water to keep the rooting mixture from drying out. Do not feed new fern. After a further three or four months move the fern into a slightly larger pot of normal potting mixture and treat it in the same way as a mature Davallia fejeensis. Problems: Generally problems appear due to incorrect treatment. Yellowing fronds with brown tips and fronds dying back are caused by high temperatures and dry air. 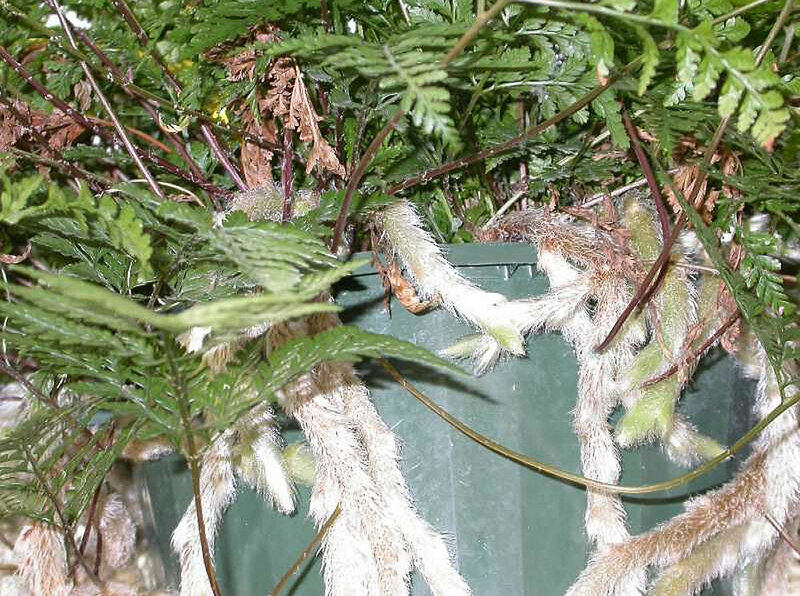 Limp, wilting, yellowing fronds indicate overwatering; these ferns must never be allowed to become waterlogged. Botrytis and aerial blights may occur. Treatment: Use an adequate fungicide. Davallia fejeensis var. plumosa produces fronds that are more finely divided than the species. Uses: With their gracefully arching fronds, Davallia fejeensis are excellent ferns for hanging baskets or for shallow pots, where – because the rhizomes normally fork into two or more sections at the points where they root – the potting-mixture surface is quickly covered.